Wishing you ‘happiness and prosperity’ for the new year. It’s Chinese New Year today so I decided it was only fitting that I cooked something from China over the weekend and I knew I wouldn’t have time to make this particular dish after work on Monday! It’s the Year of the Monkey this year and apparently those born this year will be lively, mischievous, curious and innovative! I was born in the Year of the Horse so I looked up what 2016 and the year of the monkey would mean for me. Is it going to be a lucky year? Well, apparently overall I’m going to have pretty good fortune, better career achievements and do well financially. However, I’ve be warned that with good fortune also comes bad luck so things won’t always run smoothly! I think all bases have been covered then!! Decorate your home with red lanterns. Eat fish. The word for carp sounds like ‘good luck’ and ‘gift’. Wear new clothes. Out with the old, in with the new – particularly if they are bright, happy colours. Red symbolises prosperity, so you’re advised to wear red (underwear included) to up your good fortune. A good reason as any to go shopping! Give red envelopes, or ‘hongbao’ stuffed with money. Buy, give or do four of anything. The word for four has the misfortune of sounding like the word for death and is therefore a bad omen. Eat porridge on New Year morning. Apparently it’s thought that only poor people eat porridge and you don’t want to start the New Year ‘poor’ as it’s a bad omen. Give sharp objects, scissors and knives as presents. You’re also not supposed to use these objects as any accident is thought to lead to the depletion of wealth, so that includes any cooking that involves chopping anything up. Use a broom or sweep the house on New Year’s Day, as it’s thought that this means you will sweep away good fortune. No cleaning today then! Take medicine. This means you might get ill all year. Wash your hair or visit the hairdresser. In Chinese, hair has the same pronunciation and character as ‘fa’ in fat-choy, which means ‘to become wealthy’, so it’s believed that you will wash away good fortune. I have a fab cook book by Ching-He Huang – Ching’s Chinese Food in Minutes which I have previously cooked some very successful meals from, so thought I’d try something new. I did consider making Peking Duck, but thought that might be a bit ambitious and time consuming (plus the price of duck at the supermarket was ridiculous!). This was a relatively straightforward dish to prepare and meant I had time to watch England beat Scotland in the Six Nations (yay!) while it was bubbling away on the hob. It was a really warming dish – particularly great as it was horrible and wet outside, and it was a bit different from the usual stir fry or sweet and sour pork dishes that are often associated with Chinese food. It went down a treat and I’ll definitely be making it again. Put all ingredients except blended cornflour, spring onion and coriander into a large pan and bring to boil. Turn heat down to low, cover and simmer for 2 hours. Once cooked, thicken broth (if you want to) by stirring in the blended cornflour. Garnish with spring onion and coriander and serve over rice. 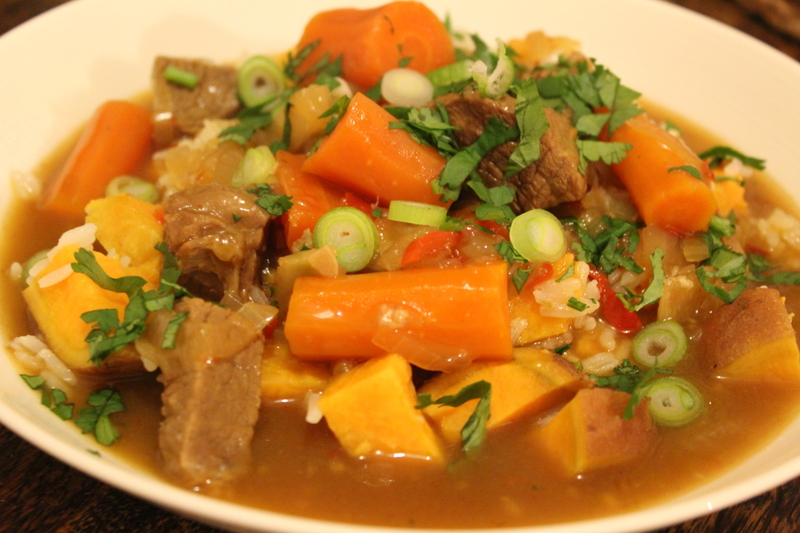 I used Ching’s Jasmine and Sweet Potato rice recipe, which worked really well (see below). Put rice into a pan with the water and sweet potato. Bring to boil. Once boiled, turn heat down to simmer, cover and cook for 20 mins. Once cooked, fluff up rice and serve immediately.